Torod Neptune, senior vice president and head of U.S. Public Affairs Practice, Waggener Edstrom Worldwide. 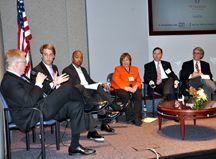 Panelists, from left, included Paul Gillin, Garrett Graff, Torod Neptune, Margery Kraus and Robert Hastings. The moderator was Patrick Cleary (right).